Natural Antioxidant Innovation Research Unit, Faculty of Technology, Mahasarakham, University, Khamriang Sub-district, Kantarawichai District, Maha Sarakham-44150, THAILAND. Aims: The characteristics, antioxidant property of Hawm Nil rice (Purple rice), Red Hawm rice (Red rice), Khao Dawk Mali 105 rice (White rice) milk kefirs and mixing of three color rice milk kefir in different ratios were investigated. Then, anti-inflammatory activity of Hawm Nil rice kefir was studied. Methodology: The physiochemical properties, total phenolic compounds and antioxidant activities of these rice milk kefirs were investigated. 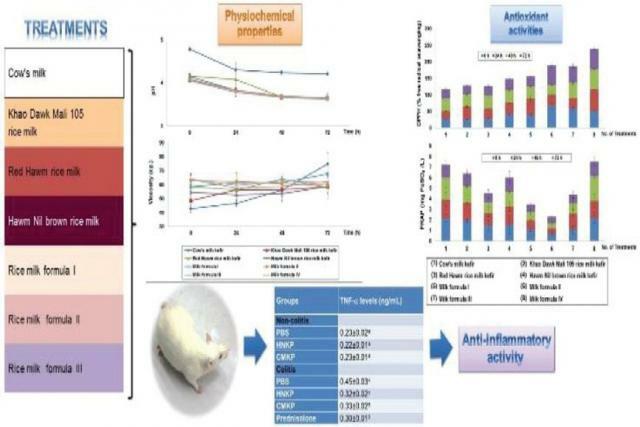 Anti-inflammatory measurements were performed to study blood chemistry, hematological values and tumor necrosis factor-a (TNF-a) level in colitis rats compared with rats treated with prednisolone (positive control) and cow’s milk kefir. Results: All the rice kefir formulas had lower pH values than the cow’s milk kefir. Moreover, they all exhibited no changing viscosity. Lactic acid concentrations increased in cow’s milk kefir during 24-48 h. Alcohol concentrations in all the rice formulas increased within 24-48 h, while cow’s milk only increased at 72 h. Antioxidant activity, most of the rice milk kefirs had antioxidant activity higher than cow’s milk by DPPH assay. In addition, the Hawm Nil rice milk kefir had high antioxidant activity by DPPH assay and FRAP assay. Blood chemistry, hematological values and tumor necrosis factor-α (TNF-α) levels in colitis rats treated with Hawm Nil rice milk kefir did not differ from those treated with prednisolone and cow’s milk kefir. TNF-α in the serum of colitis rats treated with Hawm Nil rice milk kefir was significantly reduced when compared to the PBS buffer. Conclusion: The findings indicated that color rice kefirs may offer protection against chemically induced tissue injury. Hawm Nil rice milk kefir exerted potential antioxidant and anti-inflammatory activities and was safe for human consumption. Other Thai colored rice will be used to develop Thai rice milk kefir products as new and antioxidant-rich beverages and functional foods for human health benefits in the future. Deeseenthum S, Luang-In V, Chunchom S. Characteristics of Thai Pigmented Rice Milk Kefirs with Potential as Antioxidant and Anti-Inflammatory Foods. Pharmacognosy Journal. 2018;10(1):154-161.